In addition to our Grand Cayman and Cayman Islands liveaboard programme, we have added outer island resorts - Cayman Brac Beach Resort and Little Cayman Beach Resort. Dive up to 46 dives sites including 4 wrecks with highlights the MV Capt, World Class Bloody Bay wall plus as 100 different hard and soft corals and 500 types of fish species. Cayman Brac has a rustic charm with a first class 'valet' diving service, top equipment and modern fleet of dive boats to speed you to your next amazing dive site. Little Cayman has one of the very best dive sites in the Caribbean - Bloody Bay Wall, year round, superb diving conditions, pristine coral reefs, and spectacular marine life. The Cayman Brac Beach Resort is located on Cayman Brac, part of the outer Cayman Islands group, a short flight from Grand Cayman. This 40 room boutique hotel has its own private beach, restaurant, beach side snack bar spa and an on-site PADI dive centre. Enjoy access to 46 dive sites and and 4 wrecks. A lovely location on a rustic getaway from it all island. 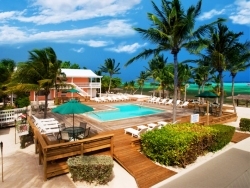 For your diving and liveaboard holiday to the Cayman Islands, Caribbean The Little Cayman Beach Resort is a small boutique hotel with 40 rooms, located on a secluded ocean front position with private beach, swimming pool, a la carte dining restaurant, boutique spa. Offering a personal service. Experience the best of diving the Cayman Islands from the resorts on-site PADI dive centre.